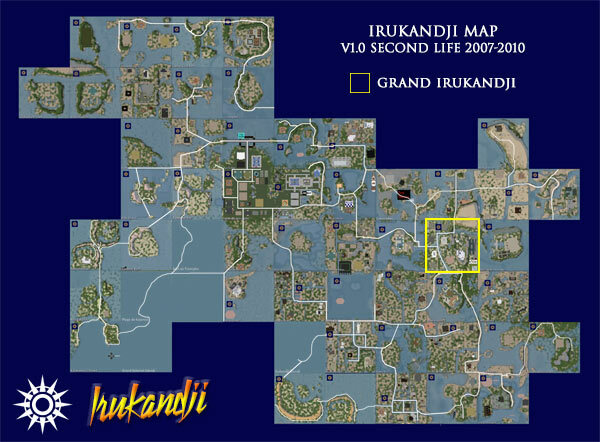 NOTE: This page is about Grand Irukandji in Second Life. 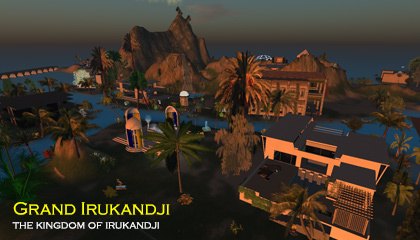 The InWorldz version is here: Grand Irukandji in InWorldz. Grand Irukandji came into being mid 2007, about three months into the first incarnation of Irukandji on Second Life. Until that point, I had been frantically building new islands in order to keep up with sales demand. However, this rapid expansion created a problem for me artistically. While I was a stickler for quality throughout, I could see that with each new residential island I made, the design was becoming repetitive. Alantay Island, Manatu Island, Pinjarra Island - they all looked somewhat similar, ie relatively flat atolls with a river and random low hills. These were the types of islands that people wanted to live on, and while they were hugely profitable, my imagination felt stifled and my frustration at having to curtail my creativity was really pushing my buttons. Nouvelle Kiribas, one of my first islands, was the standout exception. With its huge central mountain visible from all corners of the kingdom, a lot of newcomers found it a little too intimidating, and went for one of the more conventional blocks on a flat atoll-type island. All the same, Nouvelle Kiribas had very slowly gained a niche population who liked the uniqueness of its slopes and beaches. With a few 'standard' parcels still up my sleeve on Pinjarra Island, I decided to build a second unconventional island. I knew it would take longer to sell but that was fine. I needed to return to the original Irukandji concept - creating a quality estate with unique landscapes. And so, Grand Irukandji was born. While not as abrupt to the eye as Nouvelle Kiribas, Grand Irukandji did feature an enormous mountain on its northern face. I named the giant tor Mount Irukandji. Its footprint was so big that it overflowed into the three adjacent sims, Tongabuti Bay, Weta Island, and Upper Aboyo Passage. Diagonally adjacent to Irukandji's capital, Tamita Island and sharing two of its bays, Grand Irukandji also featured a half-caldera at its centre, long flat beaches in the north and east, and formed the junction of two rivers, the Maskari River and the Odin River. Due to the island's unique features and the labour I had put into its creation, I charged a premium $L26 per metre to buy the subdivided parcels. Additionally, the blocks were quite odd-shaped and unusual in size in order to fit around the many geographical features. The blocks were not particularly builder-friendly either, so it was with great astonishment that every parcel on Grand Irukandji was snapped up within days of the land being released to the market. The majority of blocks went to US buyers, plus one each from Netherlands, England, and Germany. Over the months that followed, two of the major US tenants eventually bought out their neighbours, and their vision for the island dominated Grand Irukandji. They did so in grand style, building fanciful villas and palaces that meshed beautifully with the landscape of this unique island. Their buildings were amongst the largest and most beautiful on all the islands. Throughout the life of Grand Irukandji, I maintained the southwest corner as public parkland where it joined Tamita Island. This allowed me to build a submerged section of the Trans Irukandji Causeway through the island, plus a continuous walking trail between Irukandji's two most picturesque regions. Grand Irukandji epitomised all the beautiful decadence of Irukandji's halcyon days, and also marked the start of a massive expansion of the continent in all directions. Amazingly, only a handful of photographs survive of Grand Irukandji which I took during my travels around the islands, but I am certain that more will eventually turn up. If you have some that you would like to add, please let me know in the comments section below. A process began in 2008 to divide the rapidly growing Kingdom of Irukandji into states along tribal lines. As a result, Grand Irukandji became part of Weta State. Formal elections were then held throughout the kingdom in early 2008 amongst landholders to appoint local Governors from the resident population. Grand Irukandji's major landholder Gargravarr Rau won the election and became Governor of Weta.